In her autobiography, ‘I, Win’, author Win Charles gives readers powerful inspiration and teaches them to never give up. Author Win Charles details her absolutely amazing life in her autobiography, I, Win: Hope and Life – My Journey as a Disabled Woman Living in a Non-Disabled World. A lifelong sufferer of cerebral palsy, Charles lived her life in a way that many people cannot imagine. Cerebral palsy can affect many areas of a person’s life, such as speech, movement, hearing, and seeing. Despite the seemingly insurmountable obstacle of being a person with cerebral palsy, Win chose to treat life as the gift it truly is. Instead of drowning in her sorrow and wishing she could change the cards that were dealt to her, she instead faced life head on, with vigor and strength of spirit that is rarely found. Inspired by her mother, who was her sole caregiver for twenty three years before she sadly passed away in August of 2010, Win found a reason to make her life both inspirational and moving, not only for others who suffer from cerebral palsy, but for those who don’t, as well. All too often, people can take life’s gifts for granted. Many people will never know firsthand the trials and difficulties faced by the author. However everyone, everywhere, can benefit and draw courage from her tale of incredible determination against the challenges she faced. Choosing to dedicate the book to her mother, Charles tells her story not only for those who have cerebral palsy, but for others as well, in order to let them inside the world of someone who suffers from this disease. Extraordinarily touching, powerfully moving, and never less than inspiring, I, Win is a book that will reach the hearts and minds of all readers. No matter their particular difficulties, all can draw inspiration from Win’s sunny and positive outlook on life. Win Charles was born in Aspen, CO, in 1987. She is a self-taught digital artist who uses art to express herself, as well as to cope with having cerebral palsy. I, Win is her first book, which she has dedicated to her mother, who taught her strength, passion, and to never give up. Find Win Charles on Facebook at https://www.facebook.com/Authorwc. Connect with Win Charles on her blog at http://authorwcharles.blogspot.com/. Author Judith Thomas takes readers deep into the darkest corners of the human mind with her first novel, House of Cobwebs. A combination crime and psychological thriller with heavy supernatural elements, House of Cobwebs is a twisted tale that will keep readers on the edge of their seats until the startling conclusion. Eleven year old Neema Harris has been through a horrifying trauma: during the night, her entire family was brutally murdered. Now, poor Neema is practically comatose with shock – at least, that’s what she’d like everyone to believe. Neema is a secret psychopath, blessed with the peculiar ability to enter people’s minds with her own and discover their deepest, most hidden secrets. Detective Inspector Len Axton is assigned to the case. Jaded and critical, he prefers things that are rooted in fact. However, frustrated with Neema’s silence, he calls in paranormal child psychologist Dr. Winter Fremont, hoping that she can shed some light on the puzzling circumstances that surround Neema. Dr. Fremont, however, has some dark secrets of her own, and when Neema discovers them, she finds herself haunted by both her past and the strange child she has been asked to help. Closer than ever to the real killer, Dr. Fremont and Detective Axton must use their own skills to unlock Neema’s gifts and fight their swiftly growing feelings for each other. Dr. Fremont must face her own demons, and Axton must accept the possibility of psychic phenomena as he is about to have several experiences that will change him forever. An ideal read for lovers of both supernatural and crime genres, House of Cobwebs packs a serious punch, providing plenty of nail-biting, heart-pounding twists along the way. Readers are raving about this thriller, calling it “eerie”, “gripping”, and “a real page turner”. Judith Thomas is an avid lover of both the horror and supernatural genres, as well as being a fan of a good murder mystery. She counts Stephen King as one of her literary heroes. A love of reading prompted her to write a book of her own, and the result was the phenomenal House of Cobwebs. She is looking forward to penning more novels in the future. A thrilling and fast-paced ride that takes the reader all over the world, Operation Doublepayback is a spy thriller with plenty of intrigue, danger, and even a bit of romance. Lovers of the genre will find themselves furiously flipping pages, following the twists and turns of this heart-pounding story to reach the phenomenal conclusion. The year is 1961. Max Blue thought he’s left his past well behind him when, after a series of misfortunes and upper-echelon deception led him to leave the CIA. Now living in London with his Iranian wife, Azar, and making a quiet living as a bookseller, he finds that his past has definitely caught up with him: another CIA officer named Jack Johnson is blackmailing him into danger. Johnson demands that Max and Azar infiltrate a dangerous Iranian revolutionary terror group, RPI. This infiltration will turn their once-peaceful lives upside down, as they race from city to city all over the globe, trying to stay one step ahead of the game. From assassinations in Amsterdam, to attacks on London’s U.S. Embassy, to a bomb plot in Berlin, Max and Azar cannot escape the danger they’re in. When Azar and Jack begin to find themselves attracted to each other, and an old affair of Max’s is revived at the Edinburgh Festival, it’s no longer just their safety on the line. When Max and Azar end up in New York City during the Cuban Missile Crisis, they must work together to prevent a near-certain disaster as a faction of the RPI prepares to launch an attack that could lead the world’s superpowers directly into a worldwide nuclear war. Readers will find themselves hanging on to every thrill that Operation Doublepayback has to offer. Author Jack Freeman perfects the spy thriller genre in this harrowing and exciting book, available now for readers everywhere. Jack Freeman is a long-researcher in creative thinking, problem solving, and decision making. Using settings he has experienced firsthand throughout his travels, Jack enjoys putting his characters into dangerous situations in which they have to act quickly and think even faster. 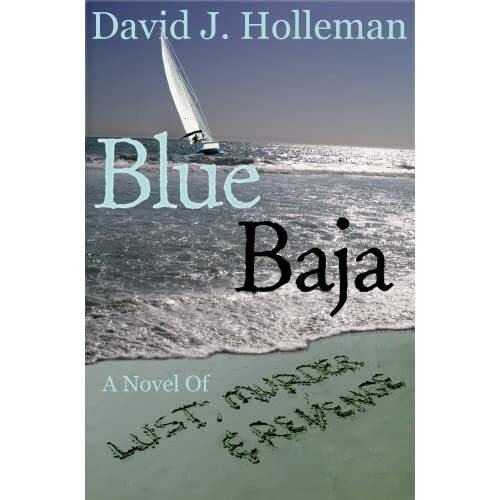 David J. Holleman’s Blue Baja is aptly subtitled “a novel of lust, murder, and revenge,” with the theme of revenge resonating powerfully throughout his page-turning story of organized crime and corruption. Luis Huerta, the drug kingpin of Baja, has spent his life dedicated to revenge, making many enemies along the way, one of which vowing his own revenge against Huerta. After the ruling drug lords attempt to show Huerta who is in charge, he vows to “get even, in spades,” forming a team of ruthless killers who murder the existing distributors, sending a shocking message of revenge when the headless bodies and pile of heads make the news. Huerta takes control of the drug trade in Baja, exacting revenge on anyone who attempts to hinder him. When narcotics detective, Alfonso Corrales begins building a case against him, threatening to topple his regime, Huerta takes cruel and sadistic revenge on him, destroying everything that he holds dear. Huerta becomes the “object of all the hate that Alfonso’s body was capable of having,” wishing for revenge of his own, wanting him dead and to be the person who kills him. In the meantime, “if he could twist a knife in Huerta’s body by harming him in any way it would just be more turkey along with the mashed potatoes, gravy, and cranberry sauce.” Huerta accrues other enemies along the way, just as intent on destruction as Corrales, seeking to meet his revenge with their own. Holleman illuminates many themes throughout Blue Baja, from the nature of organized crime to a psychological exposition of murderers. Revenge, in Blue Baja, has devastating consequences, and karma eventually comes back to those who seek it. Holleman’s powerful portrayal of revenge rivets readers from cover to cover, as the plot unfolds before them, drawing them into his compelling tale of lust, murder, and revenge. Don Bosco’s ‘The Peranakan Princess’ is the brilliant installment of his fantastic Sherlock Hong series. Author Don Bosco once again delights young readers with the second installment of his Sherlock Hong series, The Peranakan Princess. A mystical adventure series that has been likened to a “mash-up of Sherlock Holmes and Harry Potter”, Bosco’s imaginative young detective is certain to appeal to readers of all ages. It’s 1891, and Sherlock Hong is fifteen years old. Living in Singapore after being expelled from his last school for using magic and studying alchemy, he’s only trying to keep to himself, work on his studies, and stay out of trouble. But all of those well-meaning plans are about to go out the window when he learns of a plot to kidnap a young lady with very special abilities. Still eager to prove himself to the International Order of Young Seekers, Sherlock is swept up in a wild adventure that leads him all the way into the beautiful and enchanted forests of Malacca, where he stumbles upon a very interesting Peranakan tale about the beautiful Princess Hang Li Poh and her very coveted Book of Secrets. Once again, it’s up to young Sherlock to save the day (and the girl), but will he be able to do so in time? Readers will tear through the pages of this whimsical adventure to find out! Bosco’s Sherlock Hong series centers on a young man who wants to be an alchemist, and has a very particular skill that makes him a gifted detective as well. His adventures are magical, intriguing, witty, and creative, and younger readers will absolutely adore this foray into Singapore with the inquisitive Sherlock Hong to lead the way. Don Bosco describes himself as “geeky, cheeky, and magicky”. His works include the Sherlock Hong series and the Time Talisman series. Aiming to inspire and delight young readers, Don Bosco’s books are full of fun, adventure, and magic, set in the extraordinary beauty of Asia. He lives in Singapore with his wife and two sons. L.A. Noble’s ‘Max and Michelle Mystery Novels are both fun and engaging, taking readers on a wild ride through twist after twist. Author L.A. Noble’s Max and Michelle Mystery Novels give lovers of suspense something to really sink their teeth into. With quirky, charming, and intellectual crime-solving heroes Max and Michelle, Noble explores the dark secrets of small-town life. In About Time Already, Noble holds nothing back. A young woman named Jenny has returned to her hometown of New Attica, Illinois, after news that her mother has been in a terrible car accident. Reluctant to return to her past, Jenny in nonetheless swept up in the horrible misdeeds of a prominent town family, putting her life and freedom in danger. When she discovers she is being framed for a violent murder, Jenny calls her friends, Max and Michelle, to help her solve the crime and clear her name. As Max and Michelle uncover the twisted skeletons in the closets of the family framing Jenny, they also have to acknowledge their growing attraction to one another. Noble’s other Max and Michelle novel, Built to Order, centers around two identical twins, and a murder that will change one’s life forever. Amber and Brandy may look the same, but they couldn’t be more different. Amber is responsible and forthright, while Brandy’s dangerous lifestyle and penchant for seducing the wrong people puts her in harm’s way more than once. When one of the twins is found dead, Max and Michelle are called in to investigate and put to rest the mystery surrounding her death. As the search for the killer, they must also re-assess their ever-evolving relationship, taking them down a romantic road as well as a deadly one. Perfect for lovers of mystery novels, the Max and Michelle Mystery Series is engaging, fun, and witty, with plenty of twists and turns to keep readers guessing until the end. The characters are vivid and entertaining, making each novel more fun than the last. Author L.A. Noble grew up in Iowa, proud to be a member of one of the many farming families in the area. After graduating from Illinois State University with degrees in Mathematics and Psychology, Noble concentrated on raising two children and working on novels. About Time Already, one of the two books in Noble’s Max and Michelle Mystery Series, won Honorable Mention in the 2010 Los Angeles Book Festival mystery category. Evelyn and Lyndon Pugh’s ‘Paintings and Poems’ displays the individual experience of each as they experience the beauty of nature through both watercolor and word. Husband and wife team Lyndon and Evelyn Pugh explore their love of nature in all of her forms in their beautiful collection, Paintings and Poems. Using imagery from Lyndon’s moving poems, Evelyn showcases key elements of each in her vivid and striking watercolors. Examining and relating their love of the world around them to the page, Evelyn and Lyndon display both the lovely and the dark aspects of nature. Writing about a graveyard and the bones buried there, Lyndon expresses the cycle of life and the ways in which we are given back to the Earth after our deaths, as Evelyn’s dark painting represents both the trees and the people who move through them. A sense of silence and respect is clear through both the paintings and the poetry, as the artists’ awe of the nature they observe shines clearly through each piece. Each poem in the book is chosen and placed carefully into the pages, moving from the dark and lonely sides of nature, through the human experience of it, and over the entire spectrum of the beauty that surrounds us. The poetry is profound and thoughtful, and the reader gets the sense that not a comma is out of place, each considered before the work was considered complete. Evelyn’s freedom with her watercolor brush and her choice of representation of each poem is interesting, as vivid grays and blues light up a poem about the Badlands, or heavy vertical lines of black impress upon the reader the feeling of being in a deep wood. An enjoyable book for any lover of either art or poetry, Paintings and Poems is elliptical, engrossing, and beautiful, allowing the reader to feel as though they are standing in the center of the nature that the authors love so well. Evelyn Pugh uses the medium of watercolor to express her love of nature. Her original works can be seen in the collaborative volume with her husband, Lyndon, Paintings and Poems, or viewed on her website. A retired academic librarian, she is now based in Brecon, Powys, Wales. Lyndon Pugh’s poems reflect his interest in Welsh culture, history, and landscape. Now retired, Lyndon worked in various capacities in several higher education institutions. He also has experience as a lecturer, researcher, and writer in management studies. Paintings and Poems was written to express both artist’s awe of nature, as well as highlight both authors in their respective talents. In his riveting thriller, Blue Baja, David J. Holleman provides a compelling psychological exploration of the criminal mind, revealing the sadistic nature of killers and rapists, who take pleasure in crime and find pride and satisfaction in their work. Through the fictional characters of JoJo Comeaux, Claudio Huerta, and Clabe Joe Jackson, Holleman provides readers with biographies that are filled, not with remorse, but with pride. JoJo Comeaux is a mob enforcer who makes his killings a “piece of art, painted without remorse or feeling.” He is so dedicated to his craft that he travels to Israel to learn the martial arts of Krav Maga and Chicago to learn Mowie Di Do, honing his skills and perfecting his art. Jojo takes great pride in the skill involved in and sadistic nature of his killings, garnering himself a reputation for murder that is noted not only within his own organization, but by mob bosses throughout the country. His first job for the mob is enforcing his boss’ rule over Clabe Joe Jackson and his gang, who are arrogant in their pursuits and boastful about their abilities to evade arrest. As Claudio Huerta progresses from random attacks on women to planned and skillfully executed murders and rapes, he begins “making it a game,” stalking them during daylight hours until he eventually captures them. After he brutally ravages them for days and murders them, he is satiated for a short time, but after a shower and meal, the “itch” takes over him again, delighting in it as he feels it creeping over him. Each criminal illuminates a different kind of satisfaction in his work and exposes the nature of the criminal mind, giving readers perspective on the killers who pervade our headlines, mystifying viewers as to what has possessed them and how they can treat other humans in such a deplorable manner. Holleman deftly explores the criminal mind in its entirety, from its formation and motivation, to its prideful and sadistic nature. Blue Baja is a stunning work that gives readers great insight into the psychology of killers and leaves them at the edges of their seats as they move through this compelling novel. Superior storyteller Brian Etheridge takes readers to the farthest limits of their imaginations with Scared Out of My Shorts: A Collection of 11 Wicked Tales. A handful of short stories that will both scare and delight readers, Scared Out of My Shorts is illustrated by Joshua Crenshaw, and is an enjoyable read for anyone that likes to be frightened. The spooky and suspenseful tales cover the entire spectrum of the horror lover’s imagination: a murderer comes face to face with what karma is about to do with him, a man in a difficult situation must determine, and then execute, the right thing for his family, and a police officer experiences some very strange occurrences in his last few days on the job. Readers are raving over this collection, calling it “chilling” and fondly comparing it to “the suspense and strange endings…provided in the Twilight Zone series decades ago”. Scared Out of My Shorts is being touted for covering “a perfect combination of emotions”, with all of the essentials a great short story collection should offer. Suspense, fright, paranoia, and panic are superbly written, as readers are drawn into the stories from the first page. Readers who are fans of the short story format will find themselves delighted with this small but notable collection, as author Brian Etheridge’s gift of description shines through each brief glimpse into the character’s lives. Available now, Scared Out of My Shorts will have readers furiously turning pages In edge-of-their-seat excitement, and will leave them eager for more of these wickedly fun tales. A lover of words who began writing short stories in the second grade, Brian Etheridge gleans most of his story ideas from conversations with family and friends. He enjoys the succinctness of the short story and the richness of novels, both of which he has written. Brian manages technology teams for a multinational mining company, and develops educational games for the iPad platform in his spare time. Brian is an avid fan of American football, and relishes his time spent with his wife and three children. Does Book Promotion Really Work?